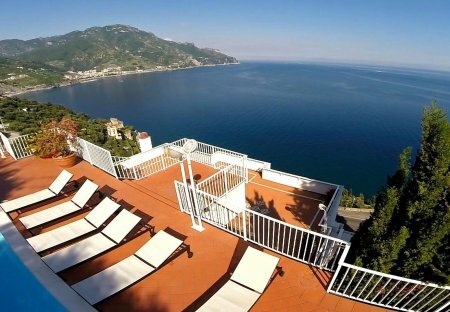 Rent villas and apartments in Ravello, Italy with private pools. Book affordable holiday rentals that are near a beach. Cosy apartment in a house with a panoramic view set on a lovely stretch of road along coast between Amalfi and Minori. Cosy apartments (IKA426 und IKA427) in a two-family-house with panoramic view and direct access to the sea, set on a lovely stretch of the road along the Amalfi Coast between Amalfi and Minori. With stunning sea views from its verdant garden and wide terraces, this magnificent, historical property is well positioned, elegantly furnished and unique. Originally a 12th-century church.